RGM-84 Harpoon firing from USS Leahy in 1983. The MBDA Exocet Anti-ship missile. The first anti-ship missiles, which were developed and built by Nazi Germany, used radio command guidance. These saw some success in the Mediterranean Theater in 1943–44, sinking or heavily damaging at least 31 ships with the Henschel Hs 293 and more than seven with the Fritz X, such as the Italian battleship Roma or the cruiser USS Savannah. A variant of the HS 293 had a TV transmitter on board. The bomber carrying it could then fly outside the range of naval AA guns and use TV guidance to lead the missile to its target by radio control. 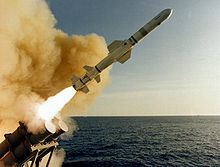 Many anti-ship missiles can be launched from a variety of weapons systems including surface warships (they can then be referred to as ship-to-ship missiles), submarines, bombers, fighter planes, patrol planes, helicopters, shore batteries, land vehicles, and conceivably, even by infantrymen firing shoulder-launched missiles. The term surface-to-surface missile (SSM) is used when appropriate. The longer-range anti-ship missiles are often called anti-ship cruise missiles. A typical abbreviation for the phrase "anti-ship missile" is ASM, but AShM can also be used to avoid confusion with air-to-surface missiles, anti-submarine missiles, and anti-satellite missiles. Anti-ship missiles were among the first instances of short-range guided missiles during World War II in 1943–44. The German Luftwaffe used the Hs 293, the Fritz X, and others, all launched from its bombers, to deadly effect against some Allied ships in the Mediterranean Sea, seriously damaging ships such as the United States Navy light cruiser USS Savannah (CL-42) off Salerno, Italy. These all used radio command-guidance from the bombardiers of the warplanes that launched them. Some of these hit and either sank or damaged a number of ships, including warships offshore of amphibious landings on western Italy. These radio-controlled missiles were used successfully until the Allied navies developed missile countermeasures—principally radio jamming. The Allies also developed some of their own similar radio-guided AShMs, starting with the U.S. Navy's SWOD-9 Bat – the first autonomously-guided, radar-homing anti-ship weapon deployed worldwide, being deployed against the Japanese in April 1945 – but the Bat saw little use in combat, partly from its own late-war deployment date. During the Cold War, the Soviet Union turned to a sea-denial strategy concentrating on submarines, naval mines and the AShM. One of the first products of the decision was the SS-N-2 Styx missile. Further products were to follow, and they were soon loaded onto the Soviet Air Force's Tu-95 Bear and Tu-22 Blinder bombers, in the case of the air-launched KS-1 Komet. In 1967, the Israeli Navy's destroyer Eilat was the first ship to be sunk by a ship-launched missile – a number of Styx missiles launched by Egyptian Komar-class missile boats off the Sinai Peninsula. In the Indo-Pakistani War of 1971 the Indian Navy conducted two raids using OSA 1-class missile boats employing the Styx on the Pakistani Naval base at Karachi. These raids resulted in the destruction or crippling of approximately two thirds of the Pakistani Navy. Major losses included two destroyers, a fleet oiler, an ammunition ship, approximately a dozen merchant ships and numerous smaller craft. Major shore based facilities, including fuel storage tanks and naval installations were also destroyed. The Osas returned to base without loss. The Battle of Latakia in 1973 (during the Yom Kippur/Ramadan War) was the scene of the world's first combat between missile boats. In this battle, the Israeli Navy destroyed Syrian warships without suffering any damage, using electronic countermeasures and ruses for defense. After defeating the Syrian navy the Israeli missile boats also sank a number of Egyptian warships, again without suffering any damage in return, thus achieving total naval supremacy for the rest of the war. 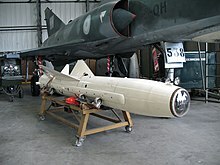 Anti-ship missiles were used in the 1982 Falklands War. The British warship HMS Sheffield, a 4,820 ton Type 42 Destroyer, was struck by a single air-launched Exocet AShM, she later sank as a result of the damage that she sustained. The container ship Atlantic Conveyor was also sunk by an Exocet. HMS Glamorgan was damaged when she was struck by an MM38 missile launched from an improvised trailer-based launcher taken from the Argentine Navy destroyer ARA Comodoro Seguí by Navy technicians, but she was able to take evasive action that restricted the damage. In 1987, a US Navy guided-missile frigate, the USS Stark, was hit by an Exocet anti-ship missile fired by an Iraqi Mirage F-1 fighter plane. Stark was damaged, but she was able to steam to a friendly port for temporary repairs. In October 1987, the Sungari, an American-owned tanker steaming under the Liberian flag, and a Kuwaiti tanker steaming under the American flag, the Sea Isle City, were hit by Iranian HY-2 missiles. In 1988 ASMs were fired by both American and Iranian forces in Operation Praying Mantis in the Persian Gulf. During this naval battle, several Iranian warships were hit by American ASMs (and by the US Navy's Standard missiles—SAMs which were doing double-duty in the anti-ship role). The US Navy hit the Iranian Navy light frigate IS Sahand with three Harpoon missiles, four AGM-123 Skipper rocket-propelled bombs, a Walleye tv-guided bomb, and several 1,000 lb "iron bombs". Despite the large number of munitions and successful hits, the 1,540 ton IS Sahand did not sink until fire reached her ammunition magazine, causing it to detonate, sinking the vessel. In the same engagement, American warships fired three Standard missiles at an Iranian Navy corvette. This corvette had such a low profile above the water that a Harpoon missile that arrived several minutes later could not lock onto it with its targeting radars. In 2006, Lebanese Hezbollah fighters fired an AShM at the Israeli corvette INS Hanit, inflicting battle damage, but this warship managed to return to Israel in one piece and under its own power. A second missile in this same salvo struck and sank an Egyptian merchant ship. Antiship missiles are a significant threat to surface ships, which have large radar, radio, and thermal signatures that are difficult to suppress. Once acquired, a ship cannot outrun or out-turn a missile, the warhead of which can inflict significant damage. To counter the threat posed, the modern surface combatant has to either avoid being detected, destroy the missile launch platform before it fires its missiles, or decoy or destroy all of the incoming missiles. Modern navies have spent much time and effort developing counters to the threat of antiship missiles since World War II. Antiship missiles have been the driving force behind many aspects of modern ship design, especially in navies that operate aircraft carriers. The first layer of antimissile defense by a modern, fully equipped aircraft carrier task force is always the long-range missile-carrying fighter planes of the aircraft carrier itself. Several fighters are kept on combat air patrol (CAP) 24 hours a day, seven days a week when at sea, and many more are put aloft when the situation warrants, such as during wartime or when a threat to the task force is detected. These fighters patrol up to hundreds of miles away from the Aircraft Carrier Task Force and they are equipped with excellent airborne radar systems. When spotting an approaching aircraft on a threatening flight profile, it is the responsibility of the CAP to intercept it before any missile is launched. If this cannot be achieved in time, the missiles themselves can be targeted by the fighters's own weapons systems, usually their air-to-air missiles, but in extremis, by their rapid-fire cannon. However, some AShM's might "leak" past the Carrier Task Force's fighter defenses. In addition, many modern warships operate independently of carrier-based air protection and they must provide their own defenses against missiles and aircraft. Under these circumstances, the ships themselves must utilize multilayered defenses which have been built into them. For example, some warships, such as the U.S. Navy's Ticonderoga-class guided missile cruisers, the Arleigh Burke-class guided missile destroyers, and the Royal Navy's Type 45 guided missile destroyer, use a combination of powerful and agile radar systems, integrated computer fire-control systems, and agile surface-to-air missiles to simultaneously track, engage, and destroy several incoming antiship missiles or hostile warplanes at a time. The primary American defensive system, called the Aegis Combat System, is also used by the navies of Japan, Spain, Norway, and South Korea, and in three new guided-missile destroyers of the Royal Australian Navy. The Aegis system has been designed to defend against mass attacks by hostile antiship missiles or warplanes. Any missiles that can elude the interception by medium-ranges SAM missiles can then be either deceived with electronic countermeasures or decoys; shot down by short-range missiles such as the Sea Sparrow or the Rolling Airframe Missile (RAM); engaged by the warship's main gun armament (if present); or, as a last resort, destroyed by a close-in weapon system (CIWS), such as the American Phalanx CIWS, Russian Kashtan CIWS, or the Dutch Goalkeeper CIWS. To counter these defense systems, countries such as Russia are developing or deploying very low-flying missiles (about five meters above sea level) that slowly cruise at a very low level to within a short range of their target and then, at the point when radar detection becomes inevitable, initiate a supersonic, high-agility sprint (potentially with anti-aircraft missile detection and evasion) to close the terminal distance. Missiles, such as the SS-N-27 Sizzler, that incorporate this sort of threat modality are regarded by U.S. Navy analysts as potentially being able to penetrate the U.S. Navy's defensive systems. Recent years have seen a growing amount of attention being paid to the possibility of ballistic missiles being re-purposed or designed for an anti-ship role. Speculation has focused on the development of such missiles for use by China's People's Liberation Army Navy. Such an anti-ship ballistic missile would approach its target extremely rapidly, making it very difficult to intercept. On February 25, 1991, during the first Gulf War, the Phalanx-equipped USS Jarrett (FFG-33) was a few miles from the USS Missouri (BB-63) and the destroyer HMS Gloucester (D96). The ships were attacked by an Iraqi Silkworm missile (often referred to as the Seersucker), at which Missouri fired its SRBOC chaff. The Phalanx system on Jarrett, operating in the automatic target-acquisition mode, fixed upon Missouri's chaff, releasing a burst of rounds. From this burst, four rounds hit Missouri which was two to three miles (about 5 km) from Jarrett at the time. There were no injuries. A Sea Dart missile was then launched from HMS Gloucester, which destroyed the Iraqi missile, achieving the first successful engagement of a missile by a missile during combat at sea. Close-in weapon systems (CIWS), including the Soviet-or Russian-made AK-630 or Kashtan/Каштан, German Millenium Gun or the Phalanx and Goalkeeper. These are automated gun systems mounted on the deck of a ship that use radar to track the approaching missile, and then attempt to shoot it down during its final approach to the target. reduction of their radar cross section (RCS) and hence radar signature. limit a ship's infrared and acoustic signature. Examples of these include the Norwegian Skjold-class patrol boat, the Swedish Visby-class corvette, the German Sachsen-class frigate, the US Navy's Zumwalt-class destroyer and Arleigh Burke-class destroyer, their Japanese Maritime Self-Defense Force's close counterparts in AEGIS warships, the Atago-class destroyer, and the Kongo-class destroyer, the Chinese Type 054 frigate and the Type 052C destroyer, Russian Navies Admiral Gorshkov class frigate and Steregushchiy-class corvette, the Indian Shivalik-class frigate and Kolkata-class destroyer, the French La Fayette-class frigate, the newer FREMM multipurpose frigate and the Royal Navy's Type 45 destroyer. In response to China's development of anti-ship missiles and other anti-access/area denial capabilities, the United States has developed the AirSea Battle doctrine. Amitai Etzioni of the Institute for Communitarian Policy Studies has characterized AirSea Battle as an escalatory military posture that entails ordering new or additional weapons systems, and has stated that AirSea Battle could "lead to an arms race with China, which could culminate in a nuclear war." ^ Bradley Peniston. "Photos of Sahand on fire". Navybook.com. Retrieved 13 November 2014. ^ "Крейсер "Адмирал Нахимов" получит гиперзвуковые ракеты". 26 October 2015. ^ "Russia has created an 'unstoppable' 4,600mph missile". 27 March 2017. ^ a b "Russia's hypersonic Zircon missile to go into serial production in 2018". Retrieved 2016-05-13. ^ "Для гиперзвуковых крылатых ракет в России создано принципиально новое топливо". vesti.ru. ^ "На испытаниях российская ракета "Циркон" достигла восьми скоростей звука". vesti.ru. ^ "Russia testing 6-Mach Zircon hypersonic missile for 5G subs - reports". Retrieved 2016-05-13. ^ "Никому в мире и не снилось: почему ракете «Вулкан» до сих пор нет равных на планете". Tvzvezda.ru. 2018-01-01. Retrieved 2018-11-21. ^ "LRASM / Long Range Anti-Ship Missile". Retrieved 2010-11-14. ^ "Arming New Platforms Will Push Up Value Of Missiles Market". Retrieved 2016-05-13. ^ "Navy Lacks Plan to Defend Against 'Sizzler' Missile". Bloomberg. Retrieved 13 November 2014. ^ David Crane (6 April 2009). "Chinese Anti-Ship Ballistic Missile (ASBM) 'Kill Weapon' Flummoxes U.S. Navy". DefenseReview.com (DR): An online tactical technology and military defense technology magazine with particular focus on the latest and greatest tactical firearms news (tactical gun news), tactical gear news and tactical shooting news. Retrieved 13 November 2014. ^ "Tab-H Friendly-fire Incidents". Gulflink.osd.mil. Archived from the original on 8 April 2010. Retrieved 2010-04-13. Wikimedia Commons has media related to Anti-ship missiles.